In 2017 this location was recognized with the Merry Maids highest award, the “Founders Award”. This award recognizes leadership, training, operational standards, helping others, growth, customer satisfaction and commitment to the clients we serve. Five time Top 20 Merry Maids award, The Dallen Peterson Award of Distinction named after the founder of Merry Maids in 1979. In 2009, awarded the National Humanitarian Award. Franchise Owner Brad Smith volunteers and coordinates with the Sheriffs Department Reserve Unit serving community needs while working with many fund raising organizations. In his words, "Community is about serving and giving back…" This also includes supporting a medical clinic in Ghana Africa with the The Yonkafa Project. Brad Smith has been the franchise owner since 2004. He was formerly a police officer/trainer, lecturer and part of the US State Department International Police Task Force serving in the Bosnia-Herzegovina Mission. Brad has lectured to over 1 million students and 250,000 parents focusing on Personal Development and Crime Prevention courses for safe homes and safe communities. Manager Zina Mayo joined the Conyers Merry Maids in 2005 serving in various capacities. 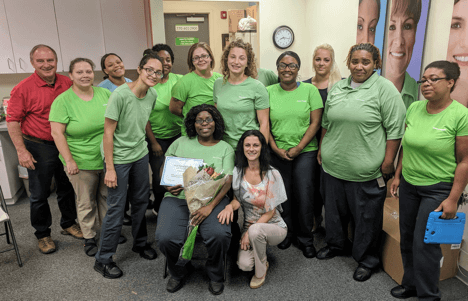 She is recognized nationally with several awards in leadership and committed customer service. More time for playing "5 Little Monkeys Jumping on the Bed"
We believe relationships are number one. Good customer service is a bi-product of the relationships to serve the on-going needs of our customers. Many of our customers started with us in 2004 when this location opened. For results unlike any other, schedule your next home cleaning service with Merry Maids®. Fill out our form or call (770) 884-6465. We provide free estimates!